ell, the time grew on that the pilgrims must go on their way; wherefore they prepared for their journey. They sent for their friends; they conferred with them; they had some time set apart, therein to commit each other to the protection of their Prince. There were again those that brought them such things as they had, that were fit for the weak and strong, for the women and the men; and so laded them with such things as were necessary. ow they went on; and when they were come to By-path meadow--to the stile over which CHRISTIAN went with his fellow HOPEFUL, when they were taken by Giant DESPAIR and put into Doubting Castle--they sat down and consulted what was best to be done: to wit, now they were so strong, and had got such a man as Mr. GREAT-HEART for their conductor, whether they had not best to make an attempt upon the giant; demolish his castle; and if there were any pilgrims in it, to set them at liberty before they went any further. So one said one thing, and another said the contrary. One questioned if it was lawful to go upon unconsecrated ground; another said they might, provided their end was good: but Mr. GREAT-HEART said, "Though that assertion offered last cannot be universally true, yet I have a commandment to resist sin; to overcome evil; to fight the good fight of faith. And, I pray, with whom shall I fight this good fight, if not with Giant DESPAIR? I will therefore attempt the taking away of his life, and the demolishing of Doubting Castle." Then said he, "Who will go with me?" hen these men had thus bravely showed themselves against Doubting Castle, and had slain Giant DESPAIR, they went forward; and went on till they came to the Delectable Mountains, where CHRISTIAN and HOPEFUL refreshed themselves with the varieties of the place. They also acquainted themselves with the shepherds there; who welcomed them, as they had done CHRISTIAN before, unto the Delectable Mountains. Now the shepherds seeing so great a train follow Mr. GREAT-HEART (for with him they were well acquainted), they said unto him, "Good sir, you have got a goodly company here; pray where did you find all these?" Next, here's old HONEST come on pilgrimage. We farther go? let's know whereon to trust." Shepherds. Then said the shepherds, "This is a comfortable company: you are welcome to us, for we have for the feeble as for the strong; our Prince has an eye to what is done to the least of these. Therefore infirmity must not be a block to our entertainment." So they had them to the palace door, and then said unto them, "Come in, Mr. FEEBLE-MIND; come in, Mr. READY-TO-HALT; come in, Mr. DESPONDENCY, and Mrs. MUCH-AFRAID, his daughter. These, Mr. GREAT-HEART," said the shepherds to the guide, "we call in by name; for that they are most subject to draw back: but as for you, and the rest that are strong, we leave you to your wonted liberty." Then said Mr. GREAT-HEART, "This day I see that grace doth shine in your faces, and that you are my Lord's shepherds indeed; for that you have not pushed these diseased neither with side nor shoulder, but have rather strewed their way into the palace with flowers, as you should". So the feeble and weak went in; and Mr. GREAT-HEART and the rest did follow. When they were also set down, the shepherds said to those of the weakest sort, "What is it that you would have? for," said they, "all things must be managed here to the supporting of the weak, as well as the warning of the unruly." So they made them a feast of things easy of digestion, and that were pleasant to the palate, and nourishing; the which, when they had received, they went to their rest, each one respectively unto his proper place. When morning was come, because the mountains were high and the day clear, and because it was the custom of the shepherds to show to the pilgrims, before their departure, some rarities; therefore, after they were ready, and had refreshed themselves, the shepherds took them out into the fields, and showed them first what they had shown to CHRISTIAN before. Then they had them to some new places. The first was to Mount Marvel; where they looked, and beheld a man at a distance that tumbled the hills about with words. Then they asked the shepherds what that should mean. So they told them that that man was the son of one GREAT-GRACE, of whom you read in the first part of the records of the "Pilgrim's Progress "; and he is set there to teach pilgrims how to believe down, or to tumble out of their ways, what difficulties they shall meet with, by faith. Then said Mr. GREAT-HEART, "I know him; he is a man above many." Then they had them to another place, called Mount Innocent; and there they saw a man clothed all in white, and two men, PREJUDICE and ILL-WILL, continually casting dirt upon him. Now, behold, the dirt, whatsoever they cast at him, would in little time fall off again; and his garment would look as clear as if no dirt had been cast thereat. Then said the pilgrims, "What means this?" The shepherds answered, "This man is named GODLY-MAN; and this garment is to show the innocency of his life. Now those that throw dirt at him are such as hate his well doing; but, as you see, the dirt will not stick upon his clothes: so it shall be with him that lives truly innocently in the world. Whoever they be that would make such men dirty, they labour all in vain; for God, by that a little time is spent, will cause that their innocence shall break forth as the light, and their righteousness as the noonday." Then they took them, and had them to Mount Charity, where they showed them a man that had a bundle of cloth lying before him, out of which he cut coats and garments for the poor that stood about him; yet his bundle or roll of cloth was never the less. Then said they, "What should this be?" "This is," said the shepherds, "to show you that he that has a heart to give of his labour to the poor shall never want wherewithal. He that waters shall be watered himself. And the cake that the widow gave to the prophet did not cause that she had ever the less in her barrel." They had them also to a place where they saw one FOOL and one WANT-WIT washing of a filthy man with intention to make him clean; but the more they washed him the dirtier he became. They then asked the shepherds what that should mean. So they told them, saying, "Thus shall it be with the vile person; all means used to get such one a good name shall, in conclusion, tend but to make him more abominable. Thus it was with the Pharisees; and so it shall be with all hypocrites." Then said MERCY, the wife of MATTHEW, to CHRISTIANA, her mother, "Mother, I would, if it might be, see the hole in the hill; or that commonly called the By-way to Hell." So her mother brake her mind to the shepherds. Then they went to the door; it was in the side of a hill, and they opened it, and bid MERCY hearken awhile. So she hearkened; and heard one saying, "Cursed be my father for holding my feet back from the way of peace and life"; and another said, "Oh that I had been torn in pieces before I had, to save my life, lost my soul"; and another said, "If I were to live again, how would I deny myself rather than come to this place!" Then there was as if the very earth had groaned and quaked under the feet of this young woman for fear; so she looked white, and came trembling away, saying, "Blessed be he and she that is delivered from this place." Now when the shepherds had showed them all these things, then they had them back to the palace, and entertained them with what the house would afford; but MERCY, being a young and breeding woman, longed for something that she saw there, but was ashamed to ask. Her mother-in-law then asked her what she ailed, for she looked as one not well. Then said MERCY, "There is a looking glass hangs up in the dining room, off of which I cannot take my mind; if, therefore, I have not, I think I shall miscarry." Then said her mother, "I will mention thy wants to the shepherds; and they will not deny it thee." But she said, "I am ashamed that these men should know that I longed." "Nay, my daughter," said she, "it is no shame but a virtue to long for such a thing as that;" so MERCY said, "Then, mother, if you please, ask the shepherds if they are willing to sell it." Now the glass was one of a thousand. It would present a man, one way, with his own feature exactly; and turn it but another way, and it would show one of the very face and similitude of the Prince of pilgrims himself. Yea, I have talked with them that can tell; and they have said, that they have seen the very crown of thorns upon his head by looking in that glass; they have therein also seen the holes in his hands, in his feet, and his side. Yea, such an excellency is there in that glass, that it will show him to one where they have a mind to see him-- whether living or dead; whether in earth or heaven; whether in a state of humiliation or in his exaltation; whether coming to suffer or coming to reign. CHRISTIANA, therefore, went to the shepherds apart (now the names of the shepherds are KNOWLEDGE, EXPERIENCE, WATCHFUL, and SINCERE); and said unto them, "There is one of my daughters, a breeding woman, that I think doth long for something that she hath seen in this house; and she thinks she shall miscarry if she should by you be denied." Experience. "Call her, call her; she shall assuredly have what we can help her to." So they called her, and said to her, "MERCY, what is that thing thou wouldst have?" Then she blushed and said, "The great glass that hangs up in the dining room." So SINCERE ran and fetched it; and with a joyful consent it was given her. Then she bowed her head and gave thanks, and said, "By this I know that I have obtained favour in your eyes." They also gave to the other young women such things as they desired; and to their husbands great commendations for that they joined with Mr. GREAT-HEART to the slaying of Giant DESPAIR and the demolishing of Doubting Castle. About CHRISTIANA'S neck the shepherds put a bracelet; and so they did about the necks of her four daughters; also they put earrings in their ears and jewels on their foreheads. When they were minded to go hence, they let them go in peace; but gave not to them those certain cautions which before were given to CHRISTIAN and his companion. The reason was, for that these had GREAT-HEART to be their guide, who was one that was well acquainted with things; and so could give them their cautions more seasonably, to wit, even then when the danger was nigh the approaching. What cautions CHRISTIAN and his companion had received of the shepherds, they had also lost by that the time was come that they had need to put them in practice. Wherefore here was the advantage that this company had over the other. That make the other life our mark and home. 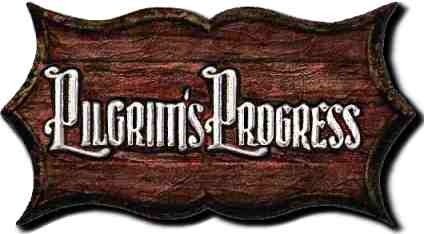 That show we pilgrims are where'er we go."